Technically it’s not the north, but Leek is only 13 miles from Macclesfield so we are back in Life in Midland Towns territory for this week’s blog post. We took the A523 from Macclesfield to Leek. It was a nice journey through the Staffordshire country side with spotted sheep scattered across the undulating hills. I can’t ever remember seeing spotted sheep before. We passed some cyclists clogging up the country lanes. They were channelling their inner Bradley Wiggins on their high spec bikes and bedecked yellow lycra tops – never a good look on a middle aged man. Leek is surprisingly industrial when you hit the outskirts of town with a chemical works and the disused mills. In Cheshire or West Yorkshire those mills would have been converted into fancy flats, however in Leek the mills had broken windows and young saplings growing out of the roofs. There was also a football club having a home game in a random football league I’ve never heard of (then again that could mean the premiership for all I know about football). We were trying to find a car park, however we found a side street with no parking restriction close to the centre of town. So we parked up for free and walked into the town centre. We hadn’t a clue what to expect. 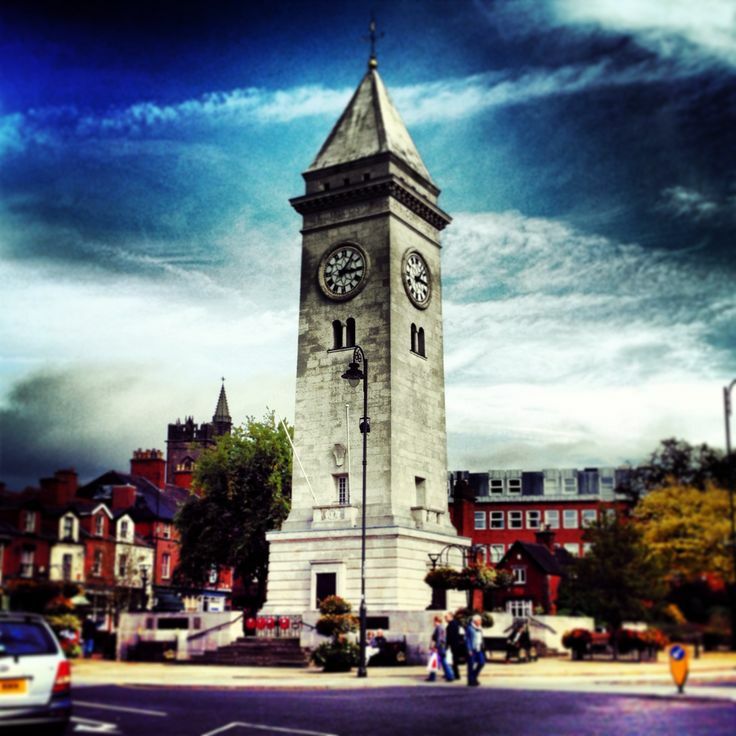 At the centre of town was a clock tower monument dominating the skyline, whilst one side of the road had a sixties style shopping centre and the other side had a hodge-podge of 18th and 19th century buildings. The sixties style building was uninspiring and there were a few empty shop fronts. On the other side it was more interesting. 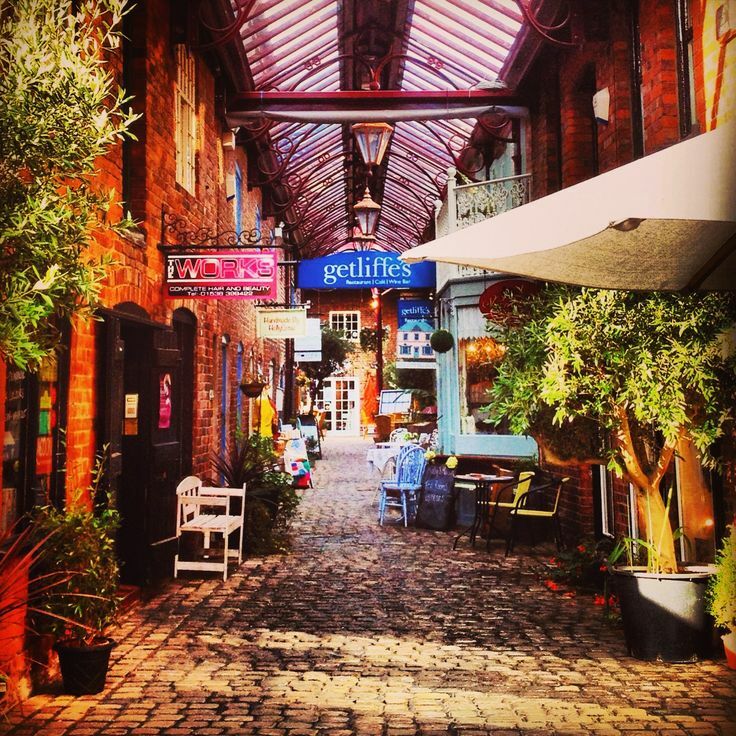 There was a little cobbled side alley covered by a glass atrium, which had an array of independent shops, cafes and restaurants. It provided a classy respite from the rest of town. Leek is full of charity shops and we had a good root through them. Neil did find some cheap 7 inch 90’s singles to buy. The shops were popular with the locals and I noticed a young family were going from shop to shop picking up cheap toys and clothes for their children. That’s one of the unsung benefits of charity shops as they truly provide a social service for families in need. There are two markets in Leek – the outdoor market in the town square and the Butter Market, which is an indoor Victorian market for the regular traders. I noticed the Butter Market had notice boards packed full of flyers for local events. I guess these are what we used to use to find out what was happening in a town pre-internet days – how retro! This Saturday the outdoor market was predominantly a second hand market with people selling collectables or bric-a-brac. It’s like a miniature version of Huddersfield’s Saturday market. However it was 3pm they were packing away for the day, so we pretty much missed it. Leek on the surface does look to be a town with chavvy elements. You can’t escape the hard lived in faces of some of the local residents wandering through the town, some walking their staffie crosses or taking a drag on their mate’s e-cigarette. There were kids determined to kill or at least maim themselves playing chicken with traffic on scooters. However I did notice Leek had some classier elements with the little cobbled arcade, a side street with nice antiques shops and some boutique pet shops. There was also a pop up shop, which is great to see as there is nothing sadder on the high street than a dusty closed down shop. 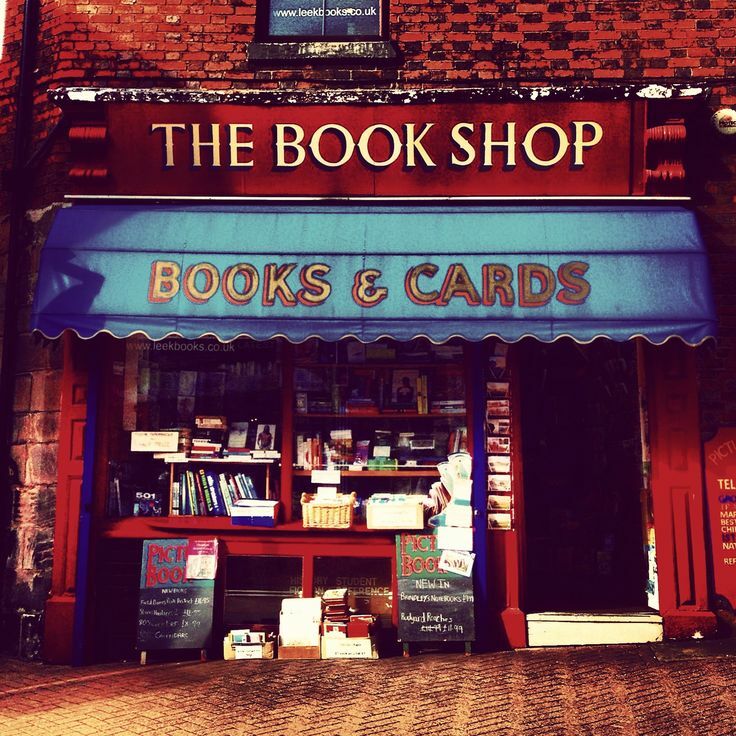 I was impressed to find an independent book shop too – gold star to Leek! Leek is pretty much off the beaten track, the nearest city Stoke-on-Trent is over half an hour drive away and the M6 even further. I really can’t imagine many visitors heading into town unless they were passing through or visiting family. 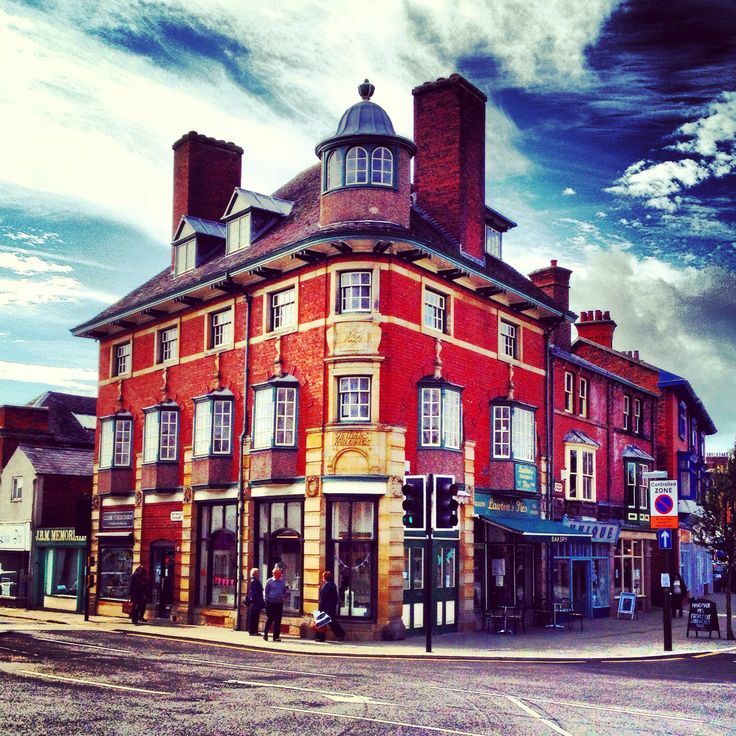 It does have some historic market town charm, apart from the 1960’s shopping parade, with nice traditional black and white pubs, mock Tudor Victorian buildings and a cobbled town square. There appears to have been no major developments in the town centre in recent years. Quintessentially Leek is how foreign tourists perceive an English market town to be, albeit a touch down at heel. Would we come back again? Only if we were passing through.